Julius Ascue was born and raised in Mt. Pleasant, SC, a suburb of Charleston. Coming from a large working class family he understood that in order to be successful, you had to work hard. Shortly after graduating from high school he decided to go along with his brother to New York to work on repairing and painting cars. One day during lunch he noticed some workers sanding floors inside of a building across the street from where he was. Being curious, he peered through the windows to observe the work they were doing. They noticed his interest and beckoned for him to try his hand at operating the machinery. The rest, as they say, is history. From that 60’s summer to today, Julius Ascue has been perfecting his skill and teaching others. Widely recognized thru the National Wood Flooring Association as one of the country's most innovative flooring masters, Julius Ascue makes big things happen to ordinary hardwood floors. For over 30 years he has been perfecting his unique art of floor designs on the homes of the famous. He has worked with several high profile Interior Designers including famous New York designer Tom Britt. 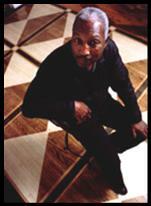 Tom Britt selected Julius to incorporate his design into the floors of homes being featured in Architectural Digest.